Dragon capsule: Gallery of photos from space and Earth. The folks at NASA’s Johnson Space Center have released a bunch of really cool photos of (or related to) the SpaceX Dragon capsule. And by “a bunch” I mean more than 300. One of my favorites is the shot above, taken on Feb. 10, after the capsule had been berthed to the space station for nearly a month (as part of the CRS-5 mission). 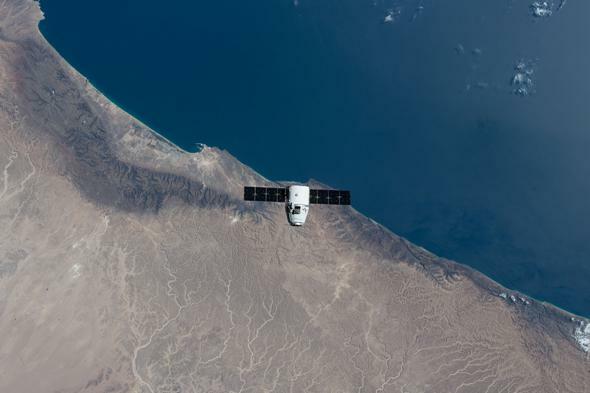 This picture was taken not long after it had been released, and I love the contrast of the capsule, solar panel “wings” extended, floating over the coast of Oman (specifically, near the port town of Raysut), the mountainous desert ending abruptly at the Arabian Sea. I recommend clicking through them; they’re pretty. I like this one as well, but then I’m a fan of entrained altocumulus clouds. JSC also put up a gallery of Orbital Sciences Corporation’s Cygnus resupply ship, too. I still can’t believe we can get such high-resolution and gorgeous photographs of space at our fingertips. We live in amazing times. Tip o’ the heat shield to David Jehl.